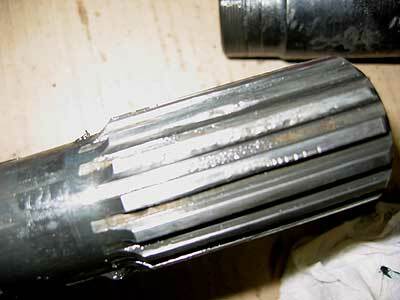 The splines are damaged on the old shaft (see picture). I did need a big hammer to get the sliding part from the shaft. 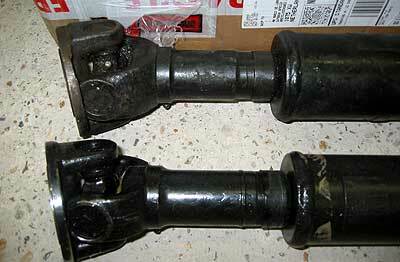 Removing the old shaft is very easy, just undo the propshaft bolts. If you don’t have UNF spanners you can use metric 14 ones. I do first remove the bolts at the differential side because then you can push the shaft to the side to get better clearance for your spanner. 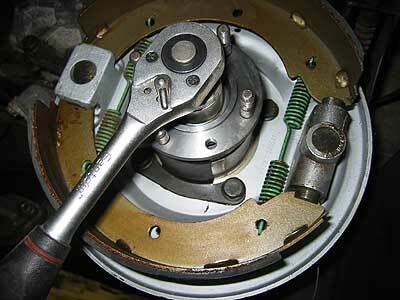 So it will be easier to remove the nuts at the hand brake drum side. You can also remove the center pannel and get access through the seat box. However more complicated. The new shaft supplied was slightly different drom the old one. As you can see the diameter is smaller compared to the old one. Also the sliding part is longer on the new shaft. I suppose this will make it a little bit stronger compared to a shaft woth a shorter sliding part. When extended there will be more overlap between the splines resulting in less (no) twisting of the sliding part. 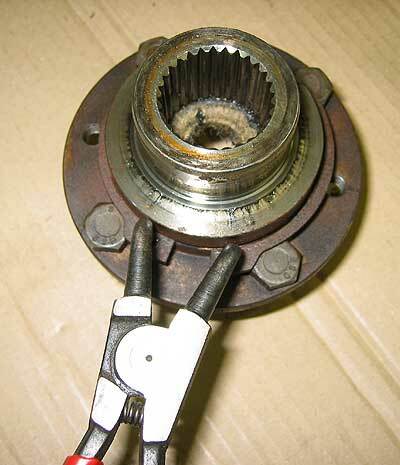 When the rear propshaft has been removed you can decide to replace the differential seal and/or the rear output shaft seal at the transfer box side. Some weeks before this job I did fit a complete rear axle with new pinion seal so there was no need to replace that one. 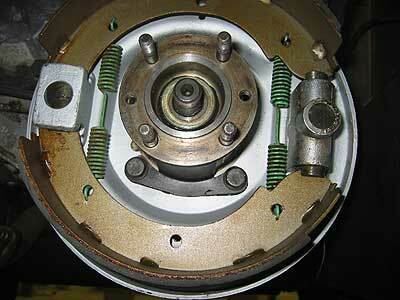 I did also rebuildt the hand brake mechanism together with replacing the output shaft seal. So both seals were new already. However I did buy a new flange for the transfer box side because the old one was a bit worn. On most vehicles it will not look like above! I did rebuildt it some weeks before. 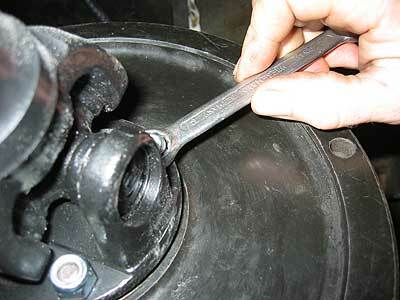 As soon as you pull out the flange oil will start dripping on your brake shoes. So if you plan to remove the flange and replace the oil seal make sure you drain the transfer box oil first. You can also remove the shoes an stuff the hole with a rag but you will always spill EP oil. Best is to remove the back plate and clean out all parts because anyway (if needed). Above the old flange, below the new kit made by Britpart. The new kit does have a different seal and comes with an new oil catcher/dust cover. I did mailorder it from DLS, (www.dls-uk.co.uk) in the United Kingdom for £ 22.72 + vat.. I decided to use the old bolts fitted to the old flange. They were still in good condition so there was no need to replace them. To get access to the bolts you will have to remove the large circlip first. Fitting the bolts and circlip to the new flange is very easy. You can decide to fit the metal oil shied too but if you do so it will not fit into the oil shield/dust cover at the rear of the transfer box. If you use this shield hammer it on using a piece of wood. The open side facing the transfer box. The edge on the new type output shaft oil seal will fit into this edge. Right now I did not use it but I will do on the next oil seal replacement. Below the oil shield on the transfer box (seperate one out off the vehicle and without back plate). So if you use the shield supplied with the kit you can not fit it into the shield on the transfer box. You might be able to fit both if you first remove it and fit it between the flange and the new supplied shield but I did not try that. Fitting back the flange is very easy. 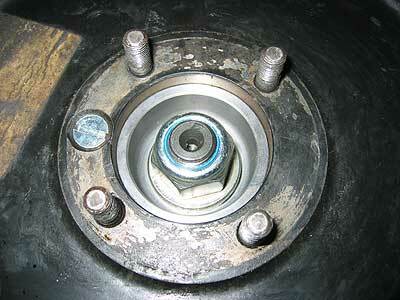 Just bolt it back and use the new nyloc nut and foam pad/washer supplied. 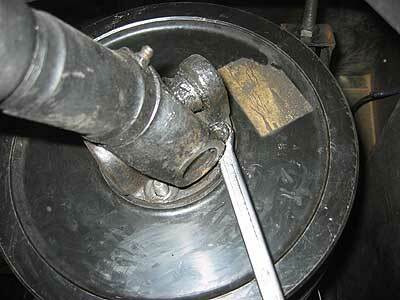 Before fitting back the hand brake drum degrease it with some petrol or thinner. 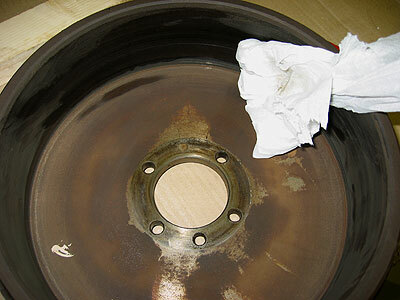 Remove also all traces of EP oil on the back plate or brake shoes. 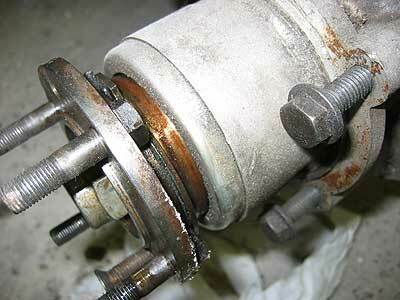 It’s advisable to use a new screw when fitting back the brake drum to the flange. It will make removing the drum in future easier. 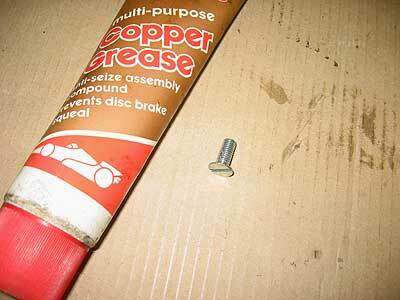 Best is to apply some copper grease to the screw too. Copper grease is your best friend! 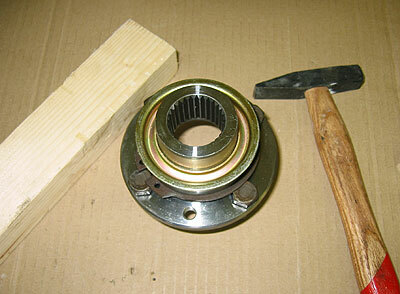 Make sure you use it on all nuts and bolts which you might have to undo again in future. 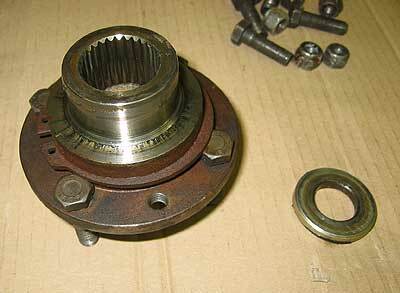 However do not use it on bolts which should be fitted with Loctite (www.loctite.com) like the crankshaft pully one at the front of the 200Tdi engine. 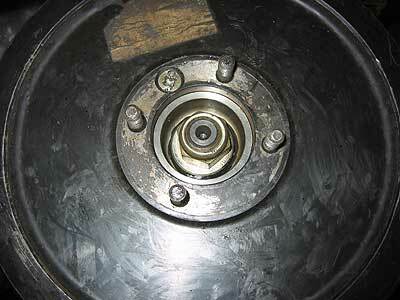 When the brake drum is back in place you can fit back the propshaft. 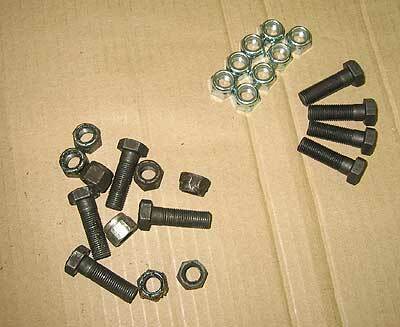 It is advisable to use new bolts and nuts. On my vehicle the nylocs could almost be remove by hand because I have been undoing the nylocs many time during the last few Months. First fit back the ones at the transfer box side. When that one is in neutral you can turn the shaft and fit back the nuts. Fit all nuts together so not one a time. I do stick my arm above the chassis rail to get access from above. When the shaft is hanging down there is no space for the spanner at the bottom side. At the back it is very easy. Recently I did read that the bolts should be at the flange side, however during my 12 year of Land Rover driving I have never been doing that. If you jack up one of the rear wheels you will be able to turn the differential & shaft which will make tightening the bolts easier. I do use two 14mm spanners. 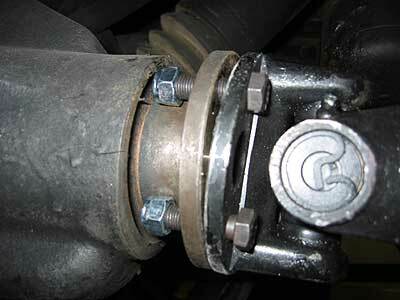 They are a tight fit on the nuts and bolts but as long the nuts are not damaged it is no problem. 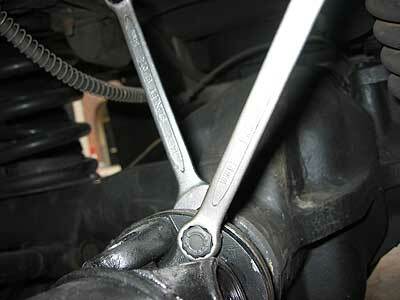 Make sure the spanner is fitted correctly before applying some force. If it slides off you will round off the nyloc. My propshaft is now in place and the back slash (play) in the drive train has been reduced a lot. If there is to much play in your drive train check the drive members (hub flanges) and the UJ’s too. The metal of the drive members is softer compared too the axle shafts and the splines will wear much faster than on the axle shafts. I replaced mine with quality parts supplied by Ashcroft, www.ashcroft-transmissions.co.uk. Look at the splines! 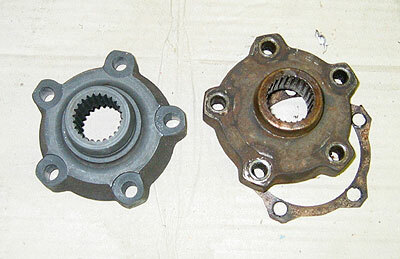 At the left the new Ashcroft one, at the right a Britpart member which has been doing 10.000km only! If you are going to replace these spend the extra money for the quality or OEM part. 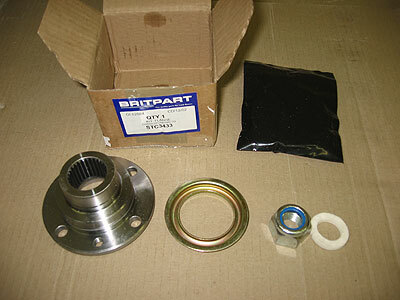 The previous shown flange kit from Britpart seems to be fine but these drive members are way to soft. Apple CarPlay we are getting there! Your Land Rover Defender better than new! If new which Defender would you buy? Land Rover Defender 4GB USB stick! Copyright © 2019 Landroverweb.com All Rights Reserved.